The artist who created the piece of art that adorns the rear exterior wall of St. Andrews Presbyterian Church was at the sanctuary on Saturday afternoon in a meet and greet session which included members of the church’s circle of friends joined with members of the Mohawks of the Bay of Quinte. 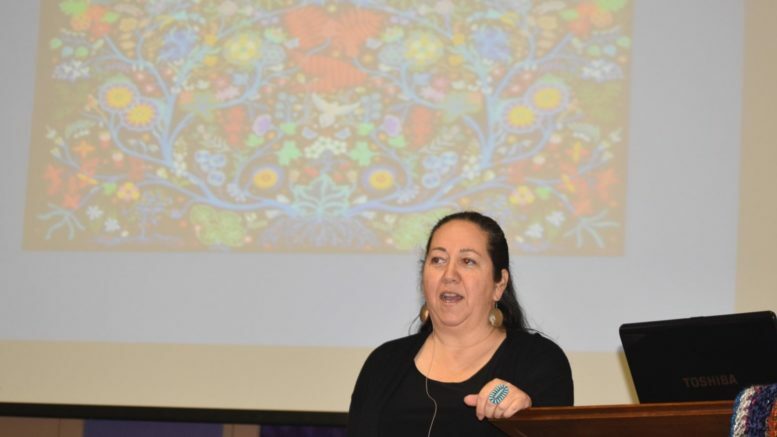 Christi Belcourt, a Metis visual artist whose Wisdom of the Universe adorns the exterior wall of St. Andrews in mural form, was at the church this weekend to speak about her craft, her connection to the earth, her inspiration and meet with supporters. The event was well attended with 80 people shaking off the cold and circling the chairs in the sanctuary to create a place of warmth and understanding. Welcomed by Longhouse leader Jan Hill with a traditional Mohawk welcoming complete with a sage smudging, the spirit of friendship and connection inside the church was undeniable. Fee will offerings, sales of prints that were used in the stencilling and mural application undertaken by Jason Roleau and MuralForm as well as collections form St. Andrew’s parishioners totalled $3,800 and those funds were donated to the Onaman Collective, a group of three Indigenous artists including Belcourt, Isaac Murdoch and Erin Konsmo who love the land, believe in the spirits of the land and believe in the resilience and beauty of their people. The Onaman Collective is a community based social arts and justice organization interested in helping Indigenous communities, particularly youth, reclaim the richness and vibrancy of their heritage including traditional arts, but with a contemporary spin. Among the projects the Collective has undertaken since forming in 2014 include workshops, canoe building, school murals and an ongoing fund for the creation of a year-round traditional camp that specializes in indigenous art and language preservation. In accepting the funds, Belcourt said she was overwhelmed by the generosity of the community and the people of the region and was also deeply appreciative for Hill’s welcoming and all of the indigenous languages. The visit by Belcourt allowed the Wisdom of the Universe project to come full circle but it’s simply an opening chapter in a reconciliation dialogue the church wishes to be ongoing. Donovan agreed there would need to be many more steps, both small and large, taken over the next years and generations but Saturday’s event was undeniably one of them. “For the past decade we at St. Andrews’ have sought to live out a vision of inclusivity, generosity and, going back, to ask ourselves hard questions about identity,” Donovan explained. Donovan said in 2018 the church body sensed it was time to have not only the conversation of the history of the church with indigenous people but also the history of our neighbours. Originally the church was planning to put a piece of Celtic art on the exterior wall but Donovan said the time was right to expand and think beyond what was traditional. In early fall, after the Wisdom of the Universe project had been finalized, St. Andrews reached out to its neighbours next door and invited them to be a part of services in the month of October. 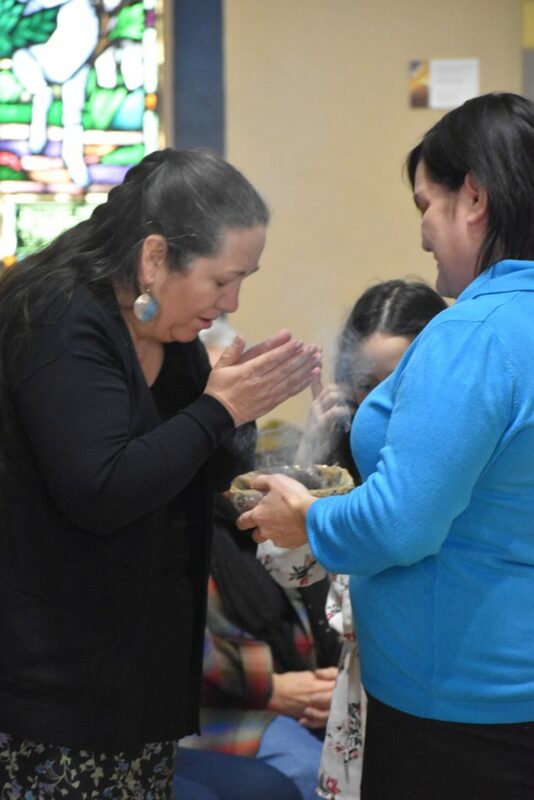 “We had Mohawk spoken and smudging at three of four services that month and the process was started with humility. I want to say we started planting seeds of healing but it will have to be a generational process,” Donovan added. Belcourt said there were common threads in her work and one of them was the slow evolution of the earth away from how the Creator placed everything. Another gift is language and Belcourt spoke of where her family originally came from which is Lac. St. Anne, AB. But her people know the lands as Manitou Saskhigan and keeping these names is vital to keeping Indigenous language alive. The path to a greater inclusivity and understanding at St. Andrews will take another step forward on Sat. Feb. 9 when Laura Maracle will facilitate the Kairos Blanket Exercise. A unique, participatory history lesson that was developed in collaboration with Indigenous Elders, knowledge keepers and educators, the exercise fosters truth, understanding, respect and reconciliation among Indigenous and non-indigenous peoples. “It’s a chance to come and learn a little bit more about how the history of this country called Canada unfolded in a way that most of us are not aware,” Donovan said. “The blankets used in the presentation represent the lands and it shows who started on the blankets and who ends up without the blankets. The event takes place at the Church and starts at 2 p.m.